3 July, 2013: We updated this story with results from the past few months of work by our “cyber farmers.” Take a look at how this people-powered project has driven improvements in action and engagement. If a recent Greenpeace Greece crowdfunding campaign is any indicator, people want to do more in support of issues they care about. Greenpeace Greece recently launched a crowdfunding initiative asking people to “plant the solutions,” for sustainable agriculture and hit its goal of raising €5,000 ($6,450 U.S.) in six days. It also drew more than 250 people to Athens city center to take part in a demonstration supporting sustainable food production. 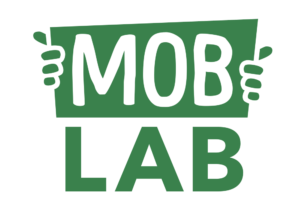 “People want to participate in many ways in Greenpeace campaigns; you just have to create an entry point,” says Lena Karvounaki, digital mobilisation team member, on what they’ve learned from their recent success. 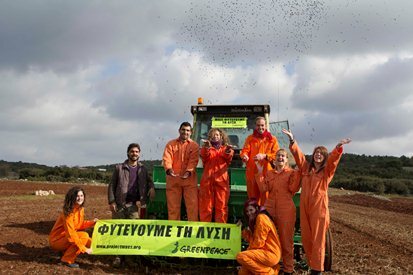 The crowdfunding initiative was sparked when Greenpeace Greece received a free parcel of land from a farmer last fall. The land provided an opportunity for Greenpeace Greece to show the country’s major dairy producers that they could switch their livestock feed from expensive imported soy protein to locally grown proteins, namely chickpeas. Two hundred and fifty people participated in forming a human banner in Athens, Greece. Chickpeas are easy to grow for farmers and if there was demand, would be a boost to the country’s struggling economy while benefiting the planet. But this effort to encourage sustainable food production needed to be more than just a Greenpeace event. “We wanted people to drive the change that we want happening in our country and the way we produce animal protein,” says Lena. With this in mind, Greenpeace Greece launched a crowdfunding campaign asking people to donate €5-300 ($6.45-$387 U.S.) towards their goal of raising €5,000 within one month that would enable them to plant chickpeas on the donated land in time for the fall cultivation period. Calling donors “cyber farmers,” people were encouraged to help “plant the solution.” They received an online certificate designating them an official cyber farmer once they did. Rewards were built into the crowd-funding options, from the online certificate to a Greenpeace calendar. Greenpeace Greece not only raised its goal of € 5,000 in six days, when the crowdfunding campaign finished it raised a total of € 9,270 ($11,958 U.S.) from 600 people. Lena says 65 per cent of the supporters were totally new to Greenpeace. Crowdfunding is one of many tools Greenpeace Greece is exploring to engage its supporters deeply in campaigns. The tools are based on their assumption that people are ready to do more, if they’re asked. “We want to create a community of people in this new era of supporters so that they’re not just contributing but also owning our campaigns, and they are playing a more active role,” explains Lena. With this in mind, Greenpeace Greece decided to continue engaging its cyber farmers after the crowdfunding campaign ended. They sent out an e-mail asking these supporters to take part in forming a human banner in the center of Athens. On a Sunday morning, 250 people participated in forming a chain and holding a banner bearing a bold message for companies and government: We are Planting the Solution. Sixty of the people who attended the event were cyber farmers. “It was fun and inspiring, they were among others who cared and shared the same interest,” Lena says. After the event, Greenpeace followed up with a survey asking for participant feedback and more campaign ideas. One hundred per cent of attendees reported they would do it again, and 60 per cent said they came because they wanted to participate in Greenpeace events. 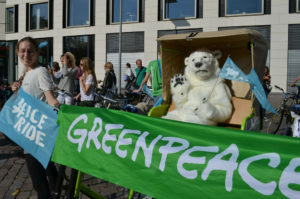 Lena says the findings show Greenpeace can attract and retain existing supporters by giving them a more active role in the course of the campaign. 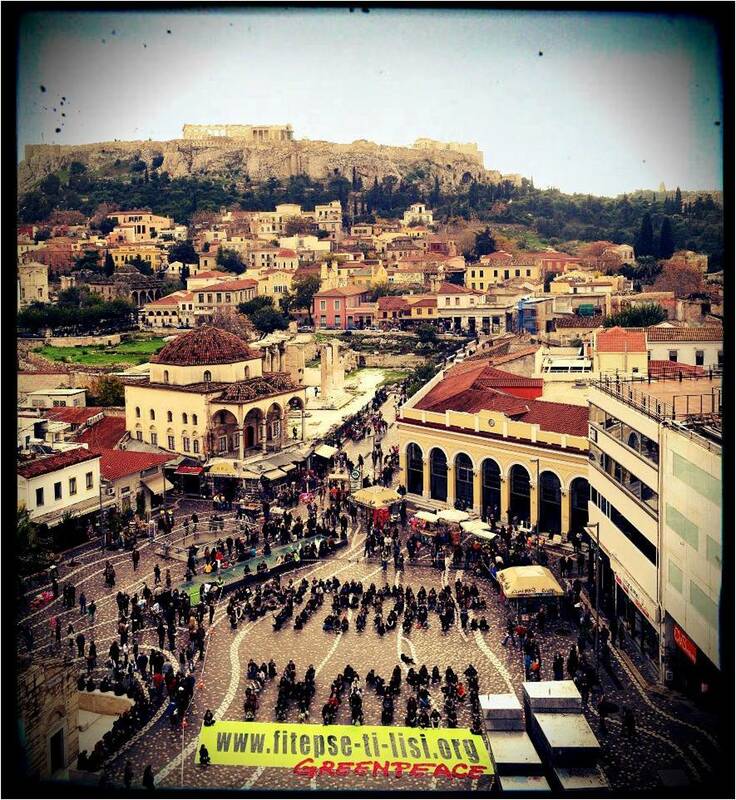 This “special treatment” will continue as Greenpeace Greece want to keep them engaged in the campaign and next steps. Greenpeace Greece is also building an online hub for Greek sustainable farming. The site features a map marking locations where farmers are planting chickpea crops. The site also contains resources, like how to grow plant proteins, and how they offer an effective replacement to GMO soy protein in animal feed. The online hub is encouraging people who have unused land to offer the space to farmers who can grow sustainable crops. Building a strong base of advocates for a new food economy is essential to catching the ear of companies and government, Lena says. “People have the power to change things. I don’t think you can make your message powerful unless you have people showcasing (solutions) to the decision-makers. Lena attributes the crowdfunding victory to its very specific ask. People weren’t asked to donate money to a campaign victory or a faraway goal, but something tangible they could make a reality in one month’s time. Planting chick peas as a sustainable solution for Greek farmers and the country’s economy was also framed as a people-powered initiative. Lena says this attracted media interest from publications on nutrition and sustainable gardening, among others. The campaign also had a strong identity, with a logo and tagline for the community of cyber farmers. Greenpeace is continuing to use this branding when communicating with this group. As for the event, it was an experiment for Greece to learn if supporters would be interested in meeting each other and participating in a public demonstration. Based on their findings, Lena says it’s valuable to connect people around shared issues, strengthening the community of supporters. • Email updates not explicitly asking for donations are garnering financial support. A recent email to inform cyber farmers about the harvest of the field and next steps saw 10 people donate through a link that was included in the footer of the email.